Put your range reports for all brands and types of firearms and other items. Finally! Yup, some nice spring weather, so off to the range we went with our usual mix bag of guns. These were the standouts, today. 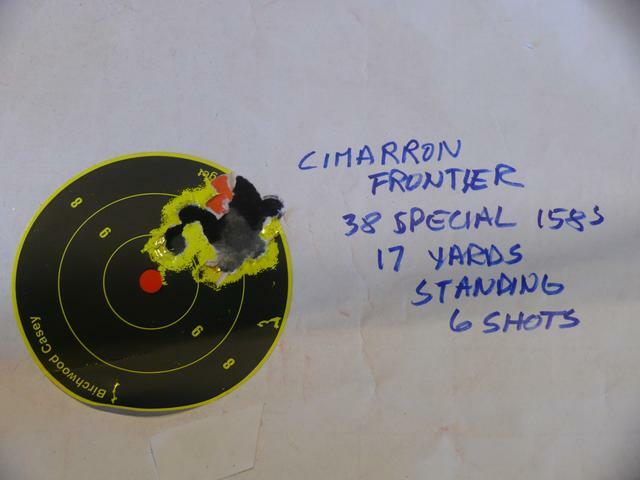 This was a recently acquired little jewel, first time to the range. Cost us, dearly, but pleased to report, not just a pretty face. Scope is a rimfire classic in a Leupold 4x Rimfire. Nice match for a trim, sweet 22 rifle. 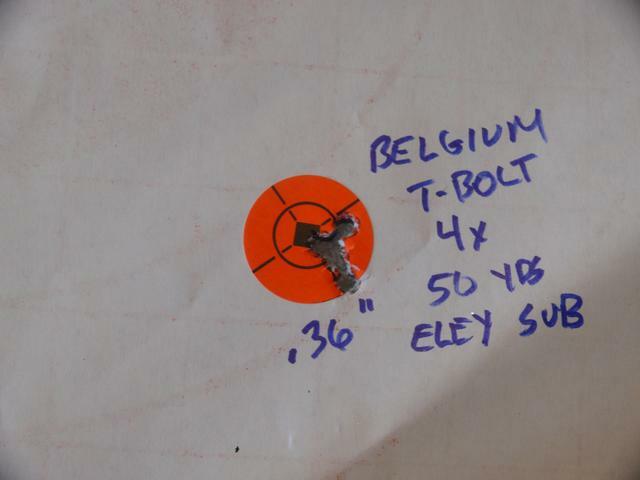 Managed some half inch groups with CCI SV at 50 yards, so had to get fancy and see what the T bolt would do with pricey Eley Subsonic. 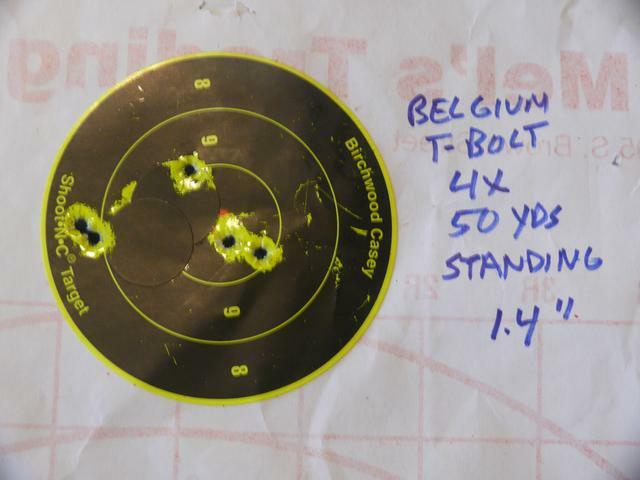 Here's a great example of why you don't need some monster 24x scope to shoot good groups at 50 yards. What you do need, though, is good optics as found in this classic Leupold 4x. This group puts this vintage T-bolt in the same excellent accuracy class as the new current T-bolts. Trigger is very nice and crisp, breaking at about 2 pounds. Another great offhand shooter for me. Bill did very well with this vintage Browning, too, using CCI SV. Dan, this one's for you. Had to bring along at least one Low Wall, this time the 22 mag. Scope is a Leupold VX 2, 4-12x40 AO. Loves the Winchester Varmint 30 grain 22 mags. 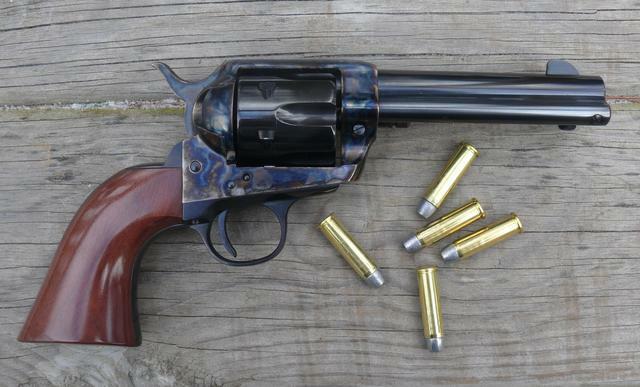 Figured I was getting rusty with my revolver shooting, so dusted off my only single action, this one a Cimarron/Pietta 357 Frontier. 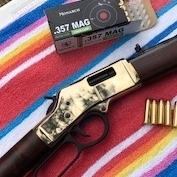 Got it cheap from a cowboy action shooter who was using it as a back up gun. He had never fired it. I filed down the front sight to accommodate sooting 38s. Okay, maybe only a little rusty. Happy dance on this one. Hope you enjoyed it, folks, and hope you can get out and do some shooting, too. Good shooting. And that Browning is to die for! Some beautiful guns and some great shooting as usual. Glad the weather is nice now so you can get out and shoot. Our weather is warm but very windy here for the last few days. Maybe shoot a day this week if the wind dies down. Yes, the little Browning is a delight in every way. Abut as good as it gets in a rifle that feels and handles like a 22 rifle, the kind of 22 you want to grab and disappear into the woods for a day of squirrel hunting. As always great shooting and beautiful guns. Looks like Jim and the T bolt get along quite well. Load on Sunday and Shoot all Week.......okay it's a Mare's Leg I will reload on Wednesday. Smokin' hot shooting. Nice to see you out again. Long winter. That revolver target is a nice one for sure. I can’t get over that tiny group with the revolver! Extremely impressive! I’m jealous. As always, WOW great shooting! Some very good shooting and great guns there! Think I will get a couple of my .22's out tomorrow. North Country Gal wrote: Finally! Yup, some nice spring weather, so off to the range we went with our usual mix bag of guns. These were the standouts, today. Sweeeeeeeeeeeeeeeeeeeeeeet, Man thats some great shooting!!!!! Doubt that I can come even close , but that certainly tells me what is possible. Thank you, and thanks for all your help with picking such a terrific rifle. Thanks also for including the details on the scope as well. I may put this off for a bit but this was extremely helpful also. By the way is the mount anything special or just an ordinary Leopold mount? If I remember correctly you said those were medium Leopold rings. I'm hoping to get mine by the end of next week or a little later.